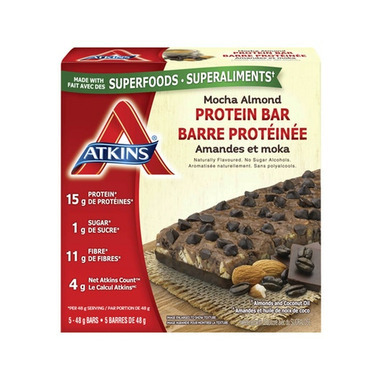 Atkins Superfood bars are made with simple, delicious ingredients without refined sugars, artificial flavors, colors or preservatives. It has 15 grams of satisfying protein, 10 g fiber, 1g sugar and just 3 net carbs. Protein Blend (Soy Protein Isolate, Whey Protein Isolate, Milk Protein Isolate, Whey Protein Concentrate), Soluble Tapioca Fiber, Almonds, Coconut Oil, Vegetable Glycerin, Soybeans, Palm Kernel Oil, Polydextrose, Natural Flavor, Cocoa (Processed with Alkali), Contains Less than 2% of: Tapioca Starch, Milk, Salt, Soy Lecithin, Sunflower Oil, Sucralose.